In a simulation suite in the new Nursing and Science building, students in a Rutgers School of Nursing?Camden class are learning to work with patients and help prevent suicides. Using standardized patients, trained actors play the role of someone who may be at risk of taking their own life. “The standardized patients are an opportunity for students to practice not only the suicide assessment but how to therapeutically communicate with patients and be comfortable being present with them,” says Mary Wunnenberg, an assistant clinical professor at the Rutgers School of Nursing?Camden. The interaction between the nursing student and patient are filmed, and following the session, students review the video with their instructors. “We really try to focus on what the students did right and touch on ways that they can improve,” says Wunnenberg. Mary Wunnenberg, an assistant clinical professor at the Rutgers School of Nursing?Camden, instructs students on how to conduct a suicide assessment. The training is especially important now. Recently, a report released from the Centers for Disease Control and Prevention shows suicide rates in the United States have risen nearly 30 percent since 1999, in both men and women, in all ethnic groups and in both urban and rural areas. 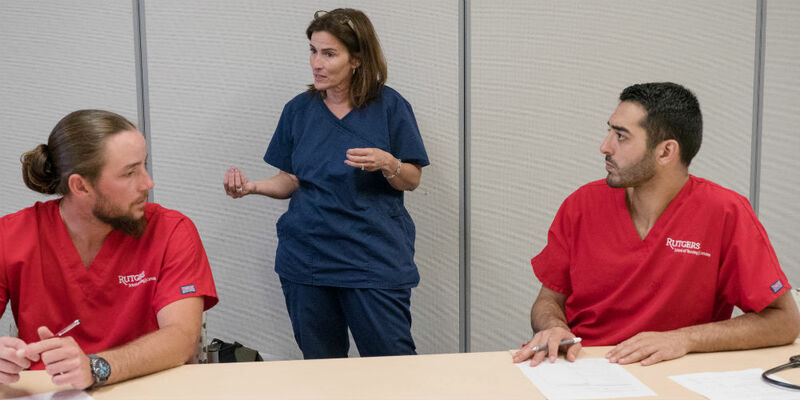 Through their work using the standardized patients, the Rutgers University–Camden students are able to learn and observe a patient’s nonverbal cues and subtle clues to indicate to a nurse the seriousness of the situation and suggest the appropriate treatment for the patient.